New Zealand’s Jess Page tries to dispossess Canada’s Kay Morissette at the 2017 FIL Rathbones Women’s Lacrosse World Cup at Surrey Sports Park, Guilford, Surrey, UK, 15th July 2017 (Credit Ady Kerry). 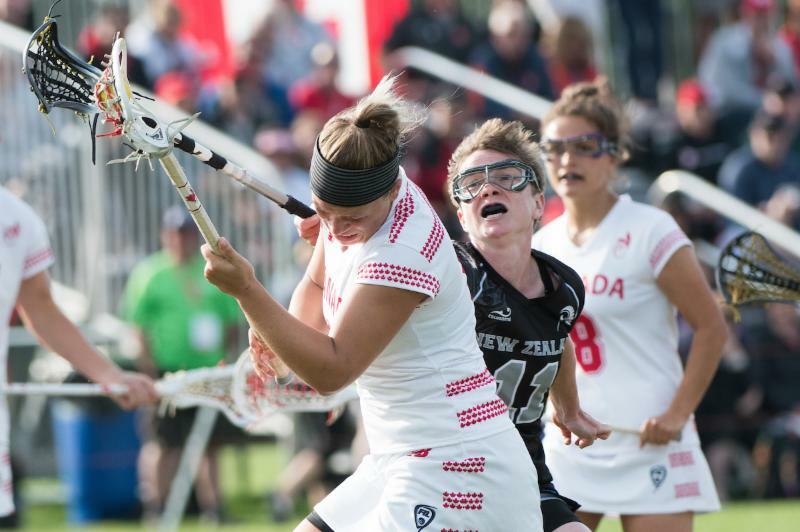 GUILDFORD, ENGLAND – Canada’s offence was dominant in their quarterfinal game of the 2017 FIL Rathbones Women’s Lacrosse World Cup, pacing them to a 16-1 victory over New Zealand. They will now face-off against Australia in the semifinals, today at 10 a.m. EST. A six point performance from both Alie Jimerson, five goals and one assist, and Dana Dobbie, three goals and three assists, led the way for the Canadians. Jimerson, the game’s most valuable player, was quick to acknowledge her teammates when asked about her impressive individual performance. In all, nine players would find the score sheet in the win. Erica Evans got her second hat-trick of the tournament, while Taylor Gait continued her strong play, scoring two of her own. Kay Morissette, Danita Stroup and Crysti Foote rounded out the scoring, adding one goal apiece. While they were outplayed by the Canadians in all aspects of the game, the New Zealand team competed hard and made some good plays on both sides of the ball, something Canada’s head coach certainly noticed. The Canadians need one more win to guarantee themselves a medal. They will first need to get by Australia, who despite losing to Canada 9-5 in pool play last week, proved they could compete. Today’s semi-final game against Australia, which starts at 10 a.m. EST, will be shown live on the BBC Sports website (geographical restrictions may apply). It can also be streamed live from anywhere in Canada through a pay-per-view webcast provided by www.247.tv.